MORRO BAY DREAM FRONT Romantic couples retreat ⚓️ This is the Bay Life... Water! Water! Water! You are surrounded by water on 3-sides with a 270 degree view of the sparkling bay and Morro Rock! One of the spectacular peninsula's on Morro Bay and the California Coast... feels like you are on an island ⚓️ Kayaks (included), hike, relax and play! This spectacular warm and inviting cottage is overlooking the magical Morro Bay, adjacent to the beautiful Cuesta Inlet and the spectacular Montana De Oro 8,000 acre State Beach. as your breathe in the ever-changing sunsets, native grasses, and sparkling sunlit sceneries. Surrounded by the breathtaking grand and ever changing back bay of Morro Bay with its extremes of golden sunlit days, foggy moments, and spectacular sunsets. Where your heart can be happy and relax! Kayaks are provided daily so you can walk out of our dream cottage and sail away across the magical bay to the secluded 8,000-acre preserve of the beautiful Montana De Oro State Beach! Call Shelene and lets chat: 805-228-2222. A majestic blend of forest and the sea! A magical place where you and your loved one can stroll the bay’s quaint paths, and wake up to the night Herons, beautiful Blue Herons, Owls, Amazing White Egrets, Red Tail Hawks, Doves, Finches and more in this amazing bird preserve! An amazing song that is in perfect harmony with nature, you can’t help but be filled with joy and peace. Enjoy the deck with your coffee, or a glass of wine at sunset overlooking the beach and sparkling bay as the white and brown pelicans arrive and lounge on the water right in front of your eyes. An explosion of your senses: quiet and calming your heart. The catamarans, the colors of the kayaks, waiting to be swept away on the beautiful back bay of Morro Bay. Welcome to the Morro Bay Cottage! In the middle of the Morro Bay's Bird Sanctuary on the back bay of Morro Bay with windy sandy beaches you can explore and meander for hours. We have 2-single kayaks and one double that our guests can use to explore the bay. Walk 20 steps and you are in the bay and ready for an amazing experience. Kayak to the deserted beaches on the 'Sand Spit' across from the Dream Cottage. When you arrive you can climb to the top of the beautiful sand mountain and you can see the incredible Pacific Ocean, and on the other side you can breathe in all of Morro Bay Estuary and the beautiful and famous Morro Rock...Breath out happiness, pure happiness! Situated on the stunning and beautiful back bay on Morro Bay! Hike the 7-preserves around Morro Bay and Los Osos: Morro Bay State Park, Montana De Oro, Ancient Oak preserve, Elfin Forest, Sweet Springs, Morro Bay Bird Sanctuary, Morro Bay Estuary. The bay has high tide twice a day and low tide twice a day, every 6 hours. It always looks beautiful and different! Welcome to the Dream Cottage on the Morro Bay Peninsula. We live in the main home On the property. You have complete privacy. If you do need anything... you can text us at 805-228-2222. Chris and Shelene believe 'life is really short and if we are able to do what we love together and help each other along the way, what a great life! By the grace of God we were able to buy our Morro Bay Dream Cottage is on a half acre of land, nestled against 11-acres of pristine beauty adjacent to one of the most beautiful state parks in the country... The 8,000 acre Stunning Montana De Oro State Park. Surrounded by water on 3 sides on a very special and unique pristine peninsula! This stunning property with every turn it will take your breath away, every window has a bay view of Catamarans, Kayaks and meandering sandy paths! Chris and Shelene live in the separate main house. You have complet privacy! Just text us if you need anything. This is a Dream for you to getaway, relax, and have a romantic vacation together... making memories that will last a lifetime! The sunsets & moon rays both reflect off the water in spectacular ways. This is the place for you to find peace and to heal! It has been compared to a bay front cottage retreat on the south of France, Cape Cod, or any stunning cottage around the world! Give us a call and let's chat about your dreams... About Chris and Shelene and Family: Their son Jesse had 4-needless brain surgeries that inspired this family to change the law nationally! Shelene was not given a simple $25 Group B Strep (GBS) test at 35 weeks of pregnancy. The cure was $10 worth of penicillin at labor. They started the Jesse Cause Foundation - Saving the Babies from GBS, named after their son. Chris and Shelene’s Goal: To get every pregnant woman in the United States tested for Group B Strep (GBS). Accomplished in 5 years on August 16, 2002, Canada and the European countries followed testing protocol. They are on a crusade to eradicate GBS. Shelene was not tested for GBS at 35 weeks of pregnancy, and their son Jesse almost died at birth and spent 2 months in the hospital. THE DREAM COTTAGE NESTLED AGAINST 11-ACRES of bayfront paths, adjacent to an 8,000-acre preserve that is called: Montana De Oro State Beach! In the middle of one of the most exquisite Bird Preserves in the world! Consisting of the most spectacular ocean cliffs and beaches on the California Coast! RELAX, UN-PLUG, AND REJUVENATE! Surrounded by 7 preserves. A Place to heal, peace and dream! We have a strict refund policy with VRBO. We will reschedule your reservation if you have a medical emergency and cannot make it. Surrounded by the Pacific Ocean and beautiful Montana De Oro state park mountain views and stunning cliffs. Morro Bay is beautiful, discover Morro Bay while staying at the Dream Cottage on Morro Bay! Feels like A private bayfront resort in the middle of an estuary and bird preserve! Beautiful pristine views of the bay from every window. Mountain views of Montana De Oro State Park. 1/2 mile away. Surrounded by Morro Bay on 3-sides of this pristine property! Morro Bay is Beautiful! Morro Bay is beautiful, discover Morro Bay while staying at the Dream Cottage on Morro Bay! The bay comes out and in twice a day! A natural estuary. It is ever changing! Sometimes it looks like a glassy lake. On low tide it can look like the mood with the sunset reflecting off its horizons! Morro Bay Beach views from every window. Morro Bay is beautiful, Discover Morro Bay! Surrounded by 7-preserves! Sea Pines 9 hole golf course is 1/2 miles away. Morro Bay is beautiful, discover Morro Bay while staying at the Dream Cottage on Morro Bay! When the Morro bay is high tide is looks like a lake:) Morro Bay is beautiful, discover Morro Bay while staying at the Dream Cottage on Morro Bay! Surrounded by the Pacific Ocean and beautiful Montana De Oro state park mountain views. Morro Bay is beautiful, discover Morro Bay while staying at the Dream Cottage on Morro Bay! Morro Bay front, kayak to the dunes across the bay and you are at the pacific Ocean. The kayaks we provide are 20 steps to the bay front. Enjoy!!! Save money on daily kayak rentals. Morro Bay front, kayak to the dunes across the bay and you are at the pacific Ocean. Carry the kayaks we provide 20 feet to the bay front. Enjoy!!! Save money on daily kayaks we provide. Morro Bay front. Water front...Surrounded by Morro bay on 3-sides of the Dream Cottage property. Almost an acre of land, on Cuesta Inlet that is miles of beaches and bay. In the middle of Morro Bay! All linens provided, including many comfy blankets to snuggle in. Beautiful quartz fireplace in living room with different flame color choices. Parked next to cottage in your driveway. A French Press and or traditional coffee pot awaits! French Roast Coffee is provided for you! Beautiful decks overlooking the bay and forest! 4 seat kayaks: 2- single kayaks and one double for you to kayak across the bay to the beautiful secluded Montana De Oro beach on the Pacific Ocean. Kayaks are included! 2 single kayaks and one double kayak provided daily! Life jackets and kayak paddles provided behind the cottage. Around the corner at Sea Pines Golf Resort is a 9 hole resort over the bay. Morro Bay Golf course is 6 minutes away. Romantic 420 sq. ft. 1-loft bedroom and bath. Bayfront Cottage in the middle of one of the most pristine peninsulas and bird preserves in the world! You will be healed at this amazing paradise peninsula! A sacred unique place to heal your happy soul! Beautiful place and beautiful people! My husband and I enjoyed our time in the Los Osos, Morro Bay and surrounding areas. This tiny house was nicely furnished and comfortable, with an RV-sized bathroom. Our gracious host, Shelene, gave us many suggestions for places to visit and left us with fresh bananas, coffee and snack bars. Host was amazing. Showed me around just after arriving. They had delicious local coffee available for us to make a pot with in the mornings, organic bananas, green protein bars, and bottled water. The place was unique with a spirited and playful vibe. It was clean and organized. But the location was the key. It truely lends you to absolute peace and solitude with water surrounding you on 3 sides. Nice, safe and quiet neighborhood. When I mentioned to the host it was my birthday, she even brought over a birthday dessert decorated thoughtfully with flowers from her garden. Gift yourself this special place and you will be most delighted you did. Magical escape to Morro Bay Dream Cottage! My husband and I, along with our two dogs, enjoyed a wonderful three day stay at Morro Bay Dream Cottage. We loved it so much we rarely left! Spent hours basking in the winter sunlight, moving from one delightful seat to another as the sun moved through the sky. The dogs romped along the shore, dipping into the water to fetch balls. At night strings of lights created a beautiful backdrop. We had everything we needed! Wish we were still there! We wanted a place to stay while exploring the Morro Vay and Los Osos area. This tiny cottage was perfect. The kitchen has a coffee maker, frig, and microwave, so we ate our breakfast in. We hiked or kayaked during the day and ate out for dinner. The tides go completely out twice a day in Los Osos and we were fascinated by the numbers of birds there on the bay. In the morning, the tide was high and we enjoyed kayaking! We just had to walk a short distance to the beach to enjoy the kayaks. The owners allowed us to use their kayaks. Nearby hiking in Montaña del Oro State Park was wonderful! We saw whale spouts from the bluff trail in the park. Our time at the VRBO and surroundings was relaxing and lovely! I have had the opportunity to stay at this property multiple times and every time I leave I feel renewed n refreshed. The cottage is darling and comfortable. The property has many mature eucalyptus trees surrounded by the bay. The hosts were very friendly! I would recommend this property to a friend. We always love having you stay at the Dream cottage ⚓️ So happy it renews your happy soul! Morro Bay Rock is famous worldwide. You can see from the bay front. The Dream Cottage is surrounded by Morro Bay on 3-sides in the middle of the back bay Morro Bay estuary and bird preserve sanctuary. 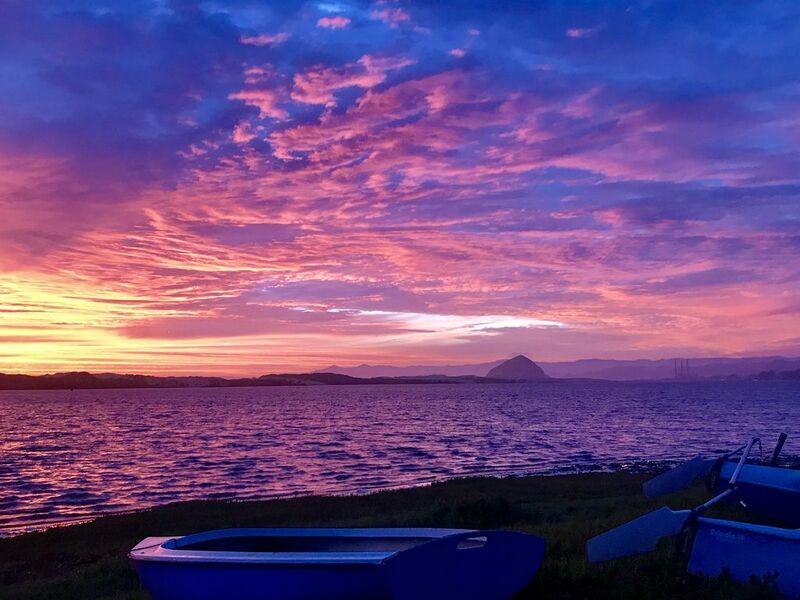 We are blessed to always get the last of the spectacular Morro Bay sunsets! The Morro Bay Dream Cottage sits on the mouth of the pristine 8,000 acres Montana De Oro State park. San Simeon Elephant seals, Hearst castle, are very close. Cambria same feel as Carmel but more secluded. Pismo Beach is 20 minutes south. Morro Bay is beautiful, discover Morro Bay while staying at the Dream Cottage on Morro Bay!